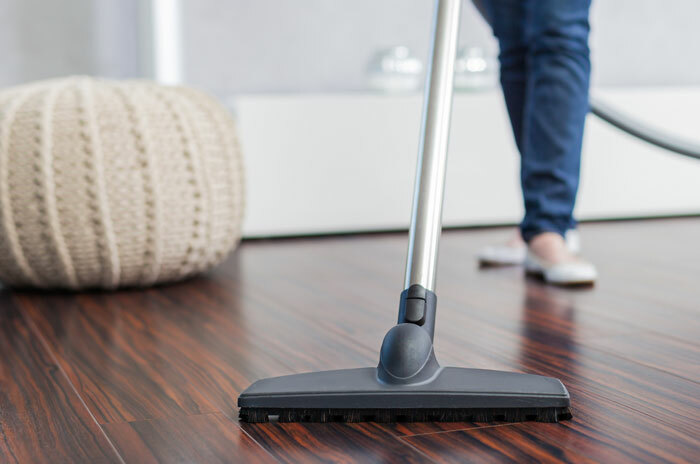 If you have never taken the time to do more than empty the canister or bag on your vacuum cleaner, you may be surprised at just how clogged the machine can get. Today I'd like to share a few steps that will will help your vacuum cleaner to run more efficiently, make less noise, and last longer. It really is not a complicated process and doesn't take too long, but will make such a difference when you clean your house. Before we begin, let me say that you should always follow the instructions that came with your vacuum to be sure that you are taking care of your machine in the best way possible. Each brand and model is different and your manual will tell you the exact parts you need and how to take apart the things you may need to clean. Anything you try you are doing at your own risk. Amazon also has a really useful set up where you can put in your make and model of vacuum cleaner and it will tell you if specific parts are compatible. And finally, be sure to unplug your machine before beginning any of these steps. So let's get cleaning, shall we?!?! The filters in your machine are meant to pick up particles that may contaminate your indoor air quality. This is especially helpful if you have allergies. When the filter is too full of dust and dirt to function, then the sweeper stops picking up these particles. Depending on the type of machine you have, you may be able to wash your filters. The filters are pretty inexpensive, though, and if you've never cleaned it before then it may be easier to just buy a new one. 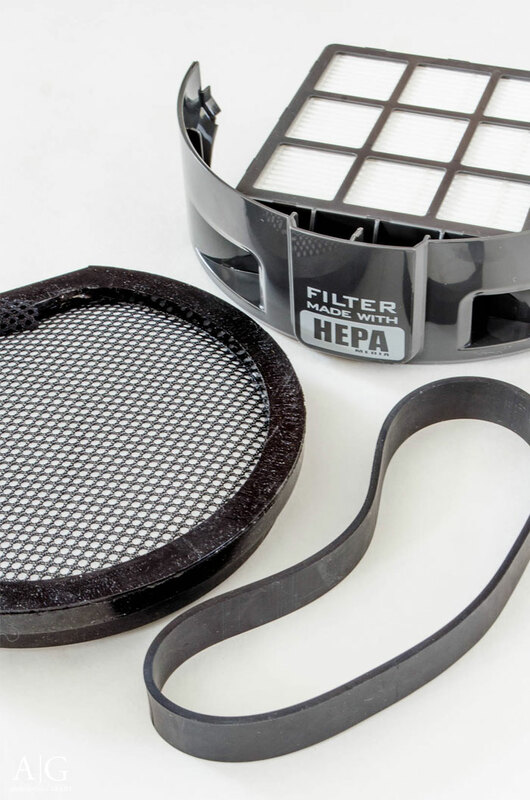 Some filters (like a HEPA filter) cannot be washed. When you are cleaning your vacuum, knock the dust off these types of filters into a garbage bag as best as you can. They need to be replaced every one to three years depending on how often you sweep. Do you know how often you should change the belt on your sweeper? I didn't before starting this process. That was astounding to me, especially since this sweeper was purchased many years ago and I've never changed the belt. The biggest different you'll notice, aside from the fact that your sweeper will now pick up dirt and debris better, is that is will do it more quietly. The belt attaches to the brush roller underneath the machine and it will have to be removed in order to replace the belt. Instructions on how to do this to your machine should be in your owner's manual. 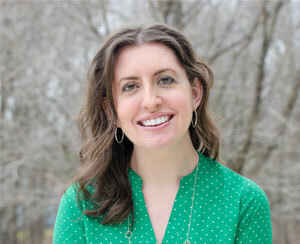 There are also many YouTube videos available on the subject. You'd be surprised at just how many pieces you can take apart on a vacuum to clean. There are many things that can be unscrewed to reveal more places that dirt can hide. The more you take apart the more you can get completely clean. Just be sure that you pay attention as you are taking it apart so that you can put everything back together correctly. Put all of the screws you remove in a ziploc bag to keep them safe. I found an old toothbrush and bent paper clip works wonders at dislodging the dirt and gunk inside of the machine. They work especially well with the cyclone inside of the canister vacuum. Wash out the canister and any pieces that you can take apart from the machine in plain warm water. If you have a bagged vacuum cleaner, your machine will be most efficient if you change the bag when it is a little past half full. If you are afraid of cleaning out the cyclone of your vacuum with water, you can also use compressed air to blow the dust out. I have not had any problems with rinsing the cyclone (which is made completely of plastic) with water. Make sure that the washable filters and parts that you take apart to wash are completely dry before putting things back together. It is not good for the machine to run with water in it and even if you don't run the machine while it is wet, you are opening the door to a mildew smell or mold starting to grow in the damp environment. Mold sure doesn't signal a clean house! I would suggest allowing the parts to dry for at least 48 hours before reattaching everything. I like to set mine on a towel in front of a heater or outside on a warm day to fully ensure that it is dry. Clean out any debris that may be stuck in the hose. 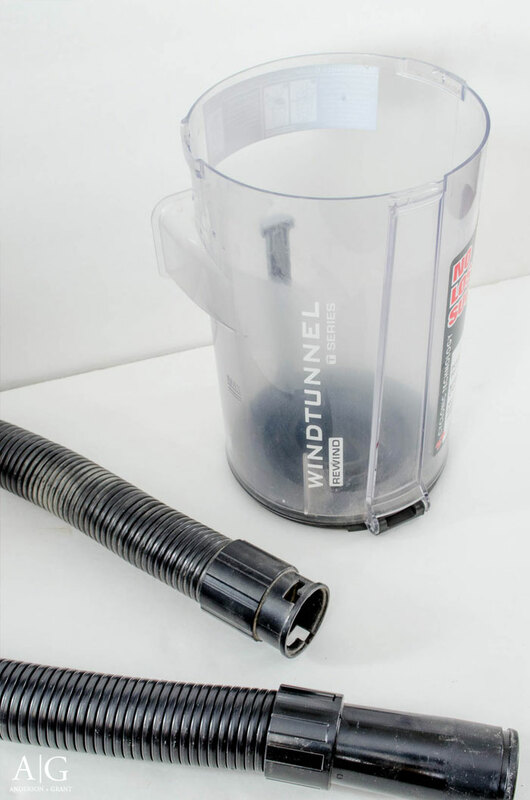 If you are in the habit of NOT cleaning out your vacuum bag or canister, it is quite possible that the hose could become clogged with balls of dust or objects that limit the suction that can come through it. You'll need to use something long like a broom handle that can push through the entire hose and unclog whatever is stopping it. The hose takes a long time to get completely dry so I would avoid using water inside of it. 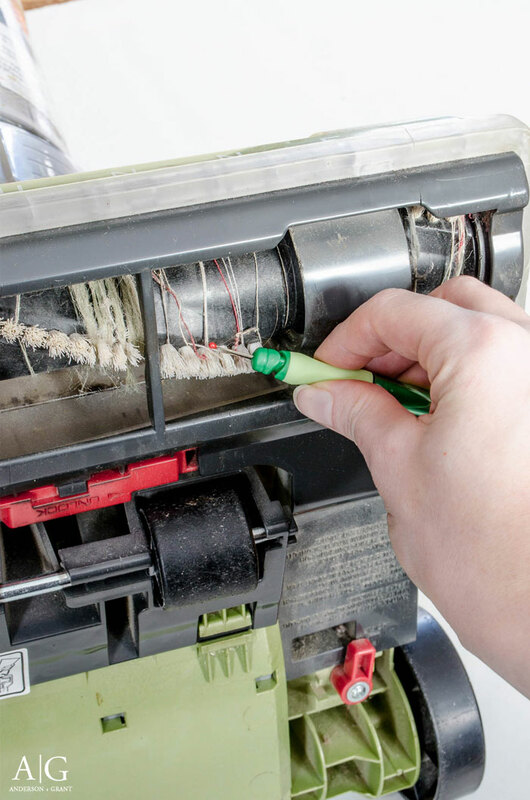 Strings and hair can become tangled in the brush roller on the underside of your vacuum which slows down it's rotation and makes it less effective at picking up dirt. It is an easy task to fix this problem using a seam ripper. It has a sharp end on it that can get behind whatever may be wrapped around the roller. Fine pointed scissors can also do the trick. Wipe off the exterior of the vacuum with a damp rag and dish soap. Rubbing alcohol or soft scrub on a cotton pad will remove any scuff marks that have formed on the sweeper. 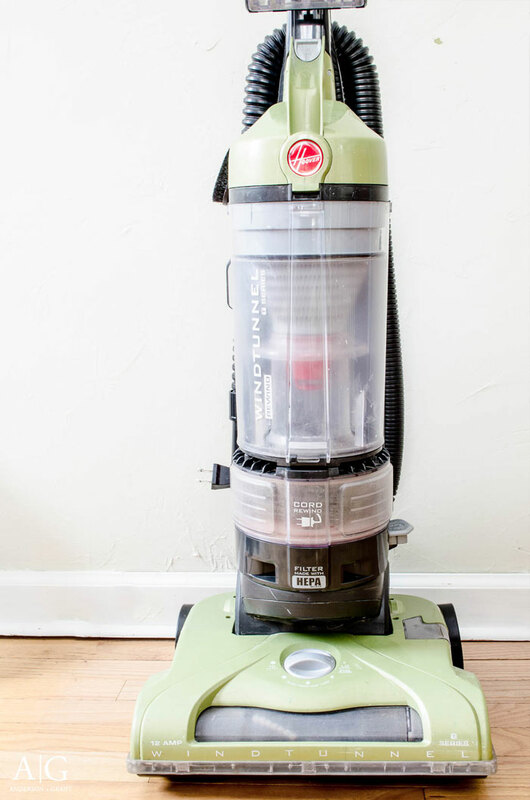 These steps will help your vacuum cleaner to look and run like new again. 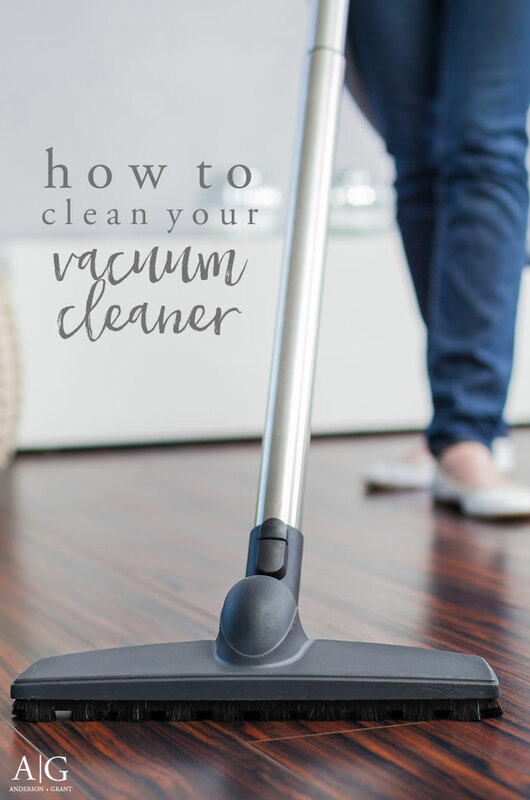 I would suggest doing this cleaning of your vacuum at least once every six months, although I normally wash out the canister and filter each month after the Saturday housework is done. If you are serious about keeping your vacuum cleaner in tip top shape, you may want to start a cleaning kit. This would keep things like extra belts and filters, a seam ripper, screwdriver, some cotton rags, and an old toothbrush in one convenient place. So when was the last time (if ever!) that you deep cleaned your vacuum cleaner? I'd love to hear what the results are if you try some of these steps!